Its been nearly 5 weeks since I have not blogged a recipe. That seems a long time. However, cooking did not stop for those 5 weeks. Like most mothers I wanted to feed everything to my daughter in the time we were with her. That includes eating out also. Over the years HSR Layout in Bangalore has grown by leaps and bounds. When my daughter first started college there, we rented an apartment near the college. At that time besides 2 main grocery stores and a Tamil cuisine take away, there was not much on the 27th Main Road. Slowly new shops and a restaurant appeared. However in the past 2-3 years HSR Layout has become a very busy hub with shops, restaurants, banks, schools, medical centers, a busy BDA complex, supermarkets, fruit and vegetable shops, etc. We no longer have to go all the way to Koramangala or Indiranagar for things. The Outer Ring road is completely changed with malls and IT parks. During this visit what I noticed sadly is that greenery is becoming less. Trees have been sacrificed in the name of development. IT parks have little patches of green grass, potted plants around. This does not necessarily mean working for the environment. Less trees means that the weather this time round was not as cold, most areas were dusty and trees did not appear luscious green. Bangalore or Bengaluru as its called is no longer the Garden City. There is still time to act now before it becomes too late. I must applaud the efforts of our building society. They have made Meenakshi Classics even more cleaner and greener. Plants have been maintained well and trees have grown. They have even made an effort to make the surrounding areas green by planting flowers, shrubs etc. Coming to the recipe, I am still on the ohhhh gosh forgot which month challenge. Anyway, we were given baked pudding recipes by Rafeeda, a fellow blogger for the Home Bakers Challenge. I missed the deadline to post the recipe, but had baked the dessert as a treat before the deadline for my daughter. 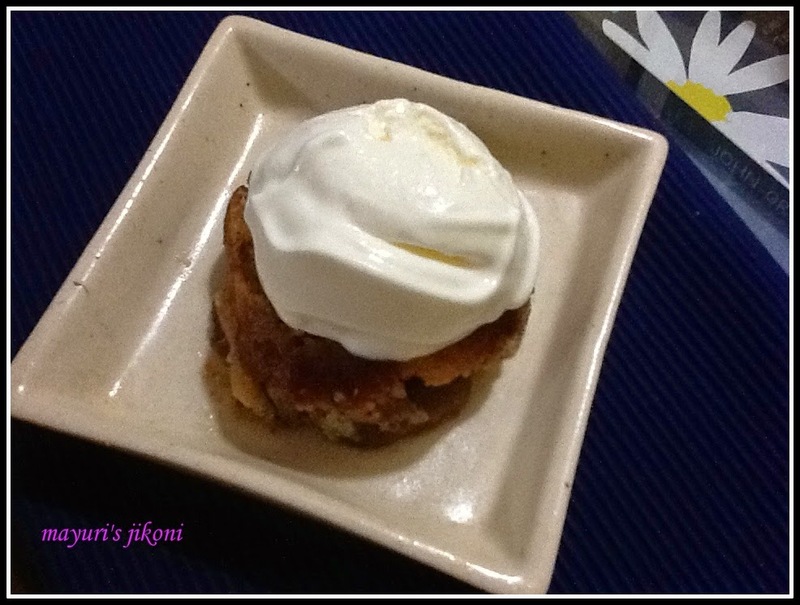 I chose to make the baked apple and almond pudding. The pudding though a bit buttery, tasted delicious. We had the left overs next day. Though it was cold straight out of the fridge, it still tasted delicious. What do you do for a cleaner greener environment in your area? Place apple slices, brown sugar, cinnamon powder and water in a saucepan. Cook the mixture over medium heat till the apples are soft. Grease a 8 inch round baking dish which is about 1¾ ” deep with butter. I used a 6″ square dish. Spread the apple slices in the greased tray. Grind the almonds into a powder. Cream butter and sugar till it is soft, creamy and pale in appearance. Beat in the eggs little at a time into the butter and sugar mixture. Fold in the almond powder slowly and gently. Spread the almond mixture over the apple slices.Even out the surface using the back of a spoon. Bake for 45 -60 minutes till the top is golden brown. Insert a toothpick into the almond layer. It should come out clean if its done. Remove the tray from the oven. Serve the pudding warm with chilled whipped fresh cream or custard. I served the pudding with some vanilla ice cream. The original recipe suggested baking the pudding on the high shelf. However, next time I will prefer to bake on the middle shelf. The top started browning quickly and I had to move the tray to the middle shelf. I added cinnamon as I feel no apple dessert is complete without it. Add flavours of your choice. Maybe next time I will reduce the amount of butter. However, must admit that the buttery taste added flavour and character to the pudding. I agree on the butter part.. In all it was a delicious pudding.. Looks yum! Lovely pudding with apple and almond Mayuri love it. Yes Sona it was a delicious pudding. Definitely will make it again.